I get a feeling in my gut that this is a very sick idea. That's my emotional response to it. I asked my almost 13 year-old what he thought and without hesitation he said, kids should want to do well anyway. Isn't paying up to $6,900 a year to dysfunctional families if they get their children to perform at school and look after their health needs, the ultimate in social experiments? Remember an earlier social experiment when government decided that society should pay single mothers a decent income to stay home and look after their kids - properly. Now we have many more dysfunctional families as a result and we want to intervene on an even greater scale?? Dysfunctional families are already being paid enough to function if they choose to. They choose not to. Who will be most affected by Bradford's Bill? There can be no doubt that the level of family violence reporting will increase after the Crimes Amendment Act comes into force. I have been reading a CYF Evaluation Report from 2000. The following excerpts point to how the police might react and who will be most effected by the passage of Bradford's Bill. CYF piloted a Safety Assessment Form for Police use when attending family violence incidents, which was intended to assess the safety of any children at the address. So Police tended to over-identify Maori and Pacific children. Of the 603 SAF notifications, 264 were assessed as needing further action from CYF. Substantiated findings of abuse were entered for 65 children. 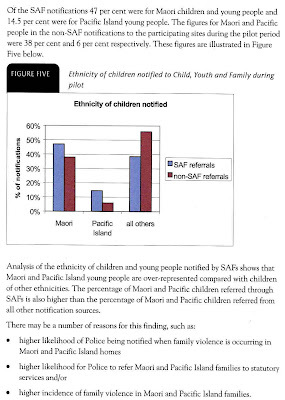 The percentage of substantiated findings for Maori children were lower than their percentage of SAF notifications. Tariana Turia knows this and yet is still supporting the legislation. I wish the Maori Party would reconsider. Police are blaming the violent Waikato (I always read the Waikato Times because stuff happens there) on drunken youth. Alcohol really is getting a bad rap at the moment. Ultimately it is still the person who uses it irresponsibly that should carry the can. But I am wondering if we won't ultimately see the re-emergence of a temperance movement? Stuff is running a poll on whether the death penalty should be re-introduced. It's running very close. I voted 'no'. But in a way I would like to vote 'yes', with a proviso. That it is voluntary. If someone who is otherwise going to be locked up for life agrees that he or she does not want to remain alive under those conditions then assisted suicide should be an option. I've long thought this but never expressed it before. No doubt people will find holes in the idea. To NZ Post - 25 percent of nothing is nothing. In fact it's worse than nothing because I won't need to buy the envelopes you sell through your Post Shops either. Steve Maharey's unparliamentary f--- you faux pas is fascinating. You see, I would never say it. I don't think it, let alone say it. I mean, I do think f--- off sometimes, in an impersonal way, especially regarding the tenth telephone canvasser of the day, local government bureaucrats, radical feminists, and tailgaters. But f--- you is quite different from f--- off. And I am bound to wonder on what other occasions the Minister finds an opportunity to use it. During caucus maybe? Today's outburst could even be a case of resentment transfer. Perhaps he really wanted to direct his conspicuous bitterness toward the head honcho whipster, although unlike Dover Samuels, Clayton Cosgrove and Damien O'Connor, Maharey probably does want to vote for the anti-smacking bill. In which case maybe it is all the dissenters in his electorate he has been muttering f--- you to in his mind. If you aren't in the habit of thinking or saying them, these things don't just slip out. The really strange thing is I am not sure whether he has gone up or down in my estimation. Touchy-feely goes feral. Sounds like the next Lynley Dodd book. A newly-released report on youth sexual health, prepared by the cross-party New Zealand Parliamentarian's Group on Population and Development (NZPPD) has highlighted New Zealand's high teenage fertility rate as a major concern and recommended increasing benefit levels and extending assistance to a younger age. Welfare commentator Lindsay Mitchell was astonished by the recommendation. "The link between teenage birth and the availability of benefits is obvious to those people who live and work in the communities where rates of teenage birth are highest. Increasing benefit levels would have the opposite effect to what the Parliamentarians are trying to achieve." "Teen parents frequently are, or become, single parents. European research released late last year, based on a sample of 6,580 single mothers, showed that the level and availability of benefits corresponds to the number of lone parents. Where benefits were increased the number of recipients went up." "The Parliamentarian's report also claims that, 'poverty is a major issue for teenage parents as little or no benefits are available until they reach 18.' "
"This is simply untrue. Sixteen and 17 year-old teenage parents are eligible for the Emergency Maintenance Allowance which pays the same rate as the DPB. At June 2006, 612 single teenage parents received this benefit. A further 2,947 single teenage parents received the DPB." "So the recommendation is not only flawed but based on misinformation. Increasing benefits to teen parents is not the way to reduce the teenage birthrate." Margaret Bazley wants more women to join the police force but wants a ban on sexual relations between serving officers. Hello???!!! How many people have relationships or meet future partners in the workplace? Police truly will have to be a special breed to defy human nature. I can't see this assisting their recruitment drive much. As in 2001, the latest survey shows that Europeans have by far the highest median net worth ($86,900), followed by Asians ($21,000), others ($19,000), Maori ($18,000) and Pacific people ($6700). These figures reflect, in part, the demographic of the various populations. The lower net worths belong to groups with very young populations. And Maori and Pacific people rent rather than buy properties. Also many European youngsters spend their early years out of NZ returning wealthier than they left. During the period when they have negative wealth they are not here to be counted. This will also skew the figures. Still the differences are quite staggering. Wait till the Maori party get a hold of it. Expect a statement by lunchtime. Notice that Maori have almost three times the net worth of Pacific people. I wonder if Tariana will say anything about that? According to the Police there were 98 homicides last year. According to Statistics New Zealand, (I)n New Zealand 'homicide' includes murder, attempted murder, manslaughter, infanticide, abortion, and aiding suicide/pact. Within this, 'murder' includes conspiracy to murder, and incite/counsel/attempt to procure murder. They can't both be right. Any input? Not quite an adoption of flat tax but a move in the right direction. This is a bad business. Obviously hospital authorities have only NOW discovered the patient with CJD had a graft from an infected donor in 1984. If they had known, presumably they would not have used any instruments on her that would then be used on other patients. Then again, it is probably naive of me to imagine that there would be a flagged question mark over this particular patient given developments since 1984 for others who received tissue from the same company. Doing God's or the government's work? Is it reasonable to smack a three-week old baby? 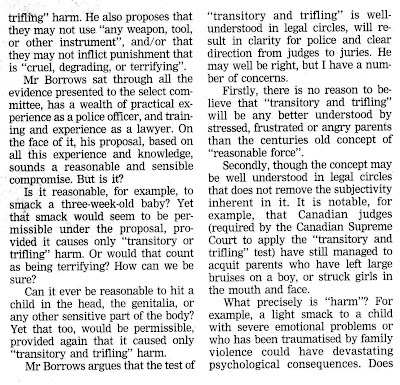 Can it ever be reasonable to hit a child in the head, the genitalia or any other sensitive part of the body? According to the PM et al it is already a crime to smack. A report of any of the above actions should be investigated. It isn't reasonable to smack a three-week old baby. It is unhinged. It isn't reasonable to hit a child in the genitalia. It is sick. Mr Edridge is banking on us agreeing with that. I believe most would which is why we have a jury system and the legal mechanism to deal with this already. 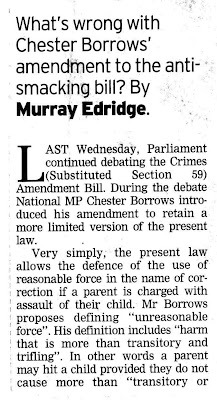 Update; From the NZ Herald; The Government is relying on child welfare groups such as Plunket and Barnardos to convince the public of the merits of Green MP Sue Bradford's so-called "anti smacking" bill. I work with a group of 'mature' volunteers. We briefly meet once a month to receive some 'supervision'. I thought you might like today's joke. I try to keep up with what's going on in the benefit/tax system. Overnight Work and Income has renamed the Family Support payments to beneficiaries, Family Tax Credits. See here. But when I check with IRD I find, as well, the Family Tax Credit has been renamed the Minimum Family Tax Credit. Confused? Hone Harawira is and I don't blame him. Mr Speaker, another important outcome of the confusion is that by using a name like family tax credit that meant one thing to now mean another, is that it becomes very difficult to get any coherent analysis of the changes for beneficiaries during that transition. He's onto it. I sent OIA questions about such matters to the IRD in December. When I tried to follow up their failure to respond they claimed they had no record of them. With no other choice, I sent the questions again, this time asking for an immediate acknowledgment. That was 12 days ago and do you think I have had a response? "It is interesting to reflect that in 1996-97 there were only 15, 242 family violence incidents reported compared with 37,112 in 2006. That shows that not only are efforts to encourage New Zealanders to report such offences actually working, but that New Zealanders feel safe in approaching the police, and that they trust the police to take appropriate action," she said. In which case the higher reports go, the better things are! The only way to tell if more people are reporting, as opposed to experiencing, crime is by comparing victimisation surveys to actual police statistics, over time. 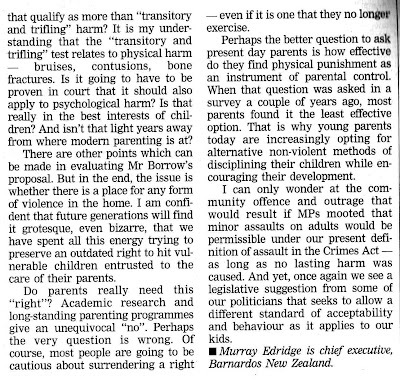 1996 - In general, the survey found that there were an estimated 2 million offences (including attempts but excluding commercial and business offences) against households and against individuals aged 15 and over in New Zealand during the 1995 calendar year and that only a small proportion of the offences disclosed in the survey (less than 13%) were recorded by the Police. 2001 - The survey count of victimisations was 1,779,657; the number of offences recorded in the Police statistics, at 263,099, represent 15% of this. As far as I can ascertain 2006 is not available yet. We will have to wait and see how right Annette King is. This doesn't surprise. 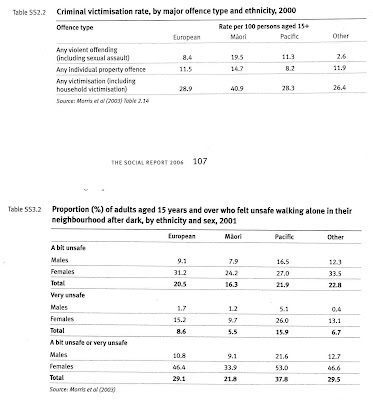 From the 2006 Social Report, which measures wellbeing, come tables relating to victimisation and perceptions of safety. Ironically Maori are most likely to be victims of crime but report highest perception of safety. I suppose that makes sense if more Maori are also perpetrators who are less likely to be afraid for their safety. Pacific people, on the other hand, are least likely to be victims but most afraid they will be. Benefits, allowances, the minimum wage and super all go up today. The cost of living rise is 2.63% but superannuitants are receiving more. Working for Families increases child tax credits by $10 per child. Beneficiaries do not receive the additional $10 per child which is why the Child Poverty Action Group is taking the government to court. 4 weeks leave kicks in and the minimum wage rises. "Taken together, these initiatives and adjustments amount to a massive delivery on this government's commitment to families and to improving the living standards of all New Zealanders," David Benson-Pope said. Not that I want the government to go anywhere near trying to influence my living standard but has any of the above enhanced your's? Someone will have to pay for the extra week's leave and minimum wage rise. The most likely candidate is the low wage worker when he loses his job. And who foots the welfare bill? Sorry, but there are no free lunches. Deborah Coddington will be expecting a reaction to her Herald on Sunday column, Is the party over for Rodney Hide?, so I'll not disappoint. Here it is. Don't rush him.